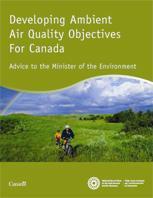 This Advisory Note is provided in response to a request for advice from the federal government in Fall, 2006, regarding national objectives for ambient air for particulate matter and ozone for both the medium-term (2020-2025) and the long-term (2050).The advice is intended to assist the federal government in its development of national ambient air quality objective for Canada. The NRTEE research and this Advisory Note focuses our advice on the process of setting national objectives, rather than specific numerical targets. 3. An independent science-based process should be established to develop Canada’s long-term national ambient air quality objectives.